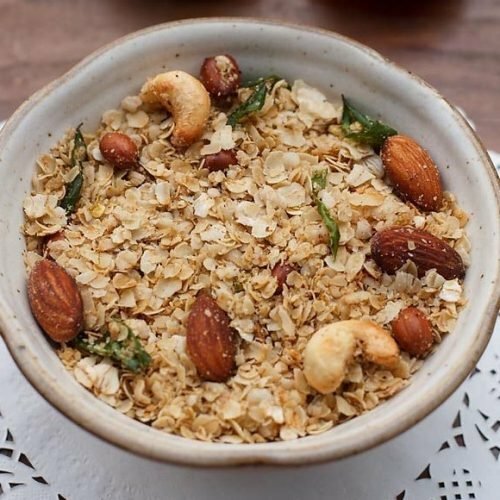 roasted oats chivda is a savory mixture of roasted oats, nuts, spices and herbs. 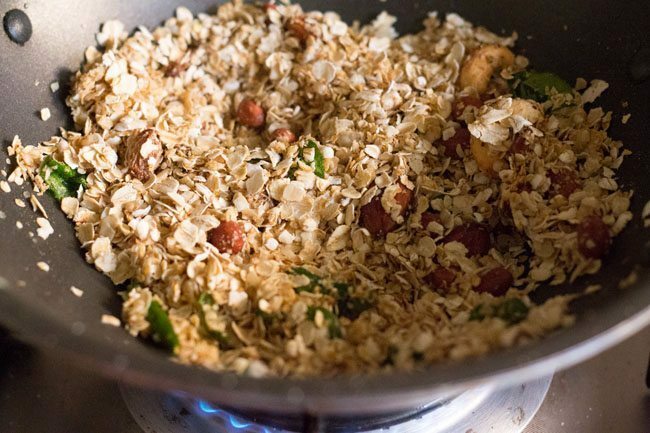 oats chivda recipe with step by step photos. 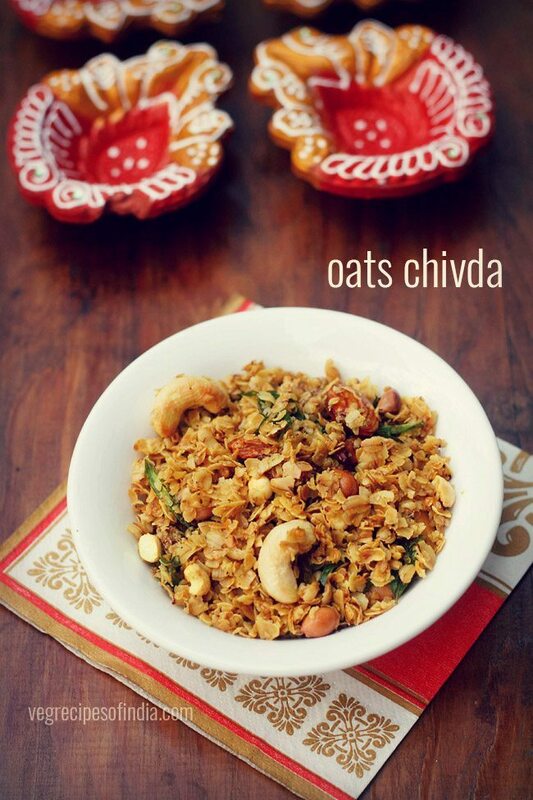 this chivda recipe is a savory mixture of roasted oats, sauteed nuts, spices and herbs. as i had mentioned in the fried version of oats chiwda, that i will be sharing another version of oats chiwda. hence this recipe post. this is a healthier version of oats chivda. 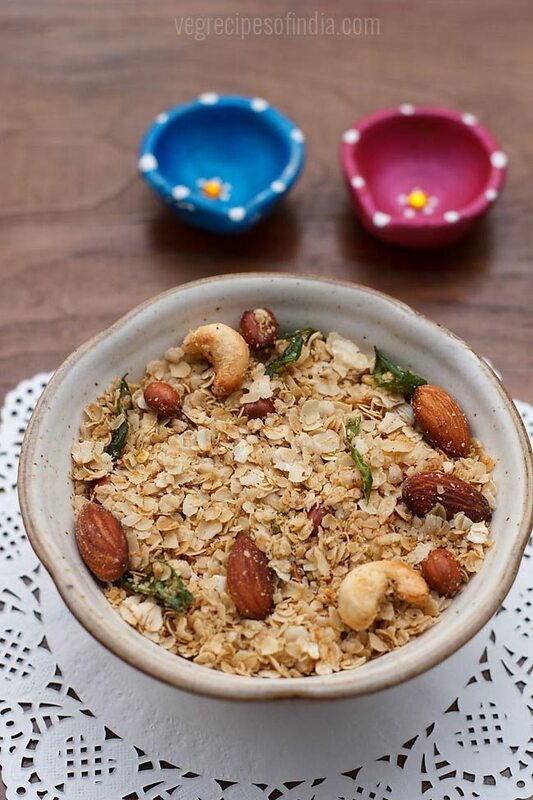 this oats chivda can be eaten as a light snack or a quick snack. 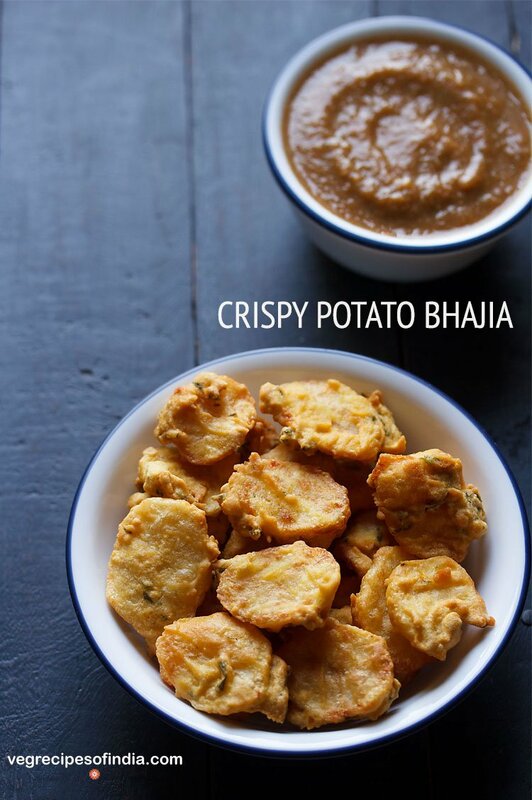 you can even pack the chivda in tiffin box or serve as diwali savory snack. 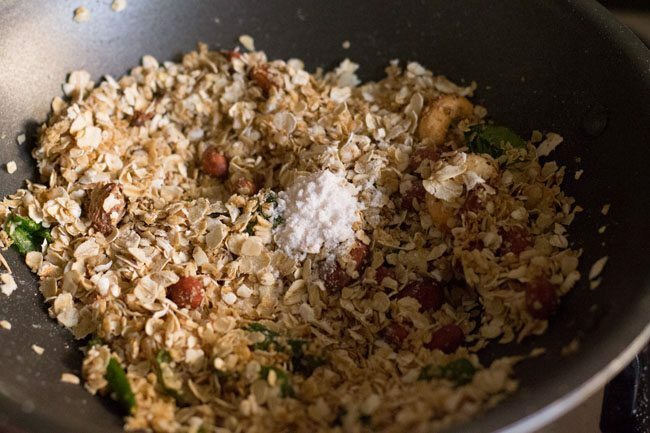 also oats don’t double up in size as poha, hence the dry fruits used are less in quantity. if you want you can add more dry fruits. 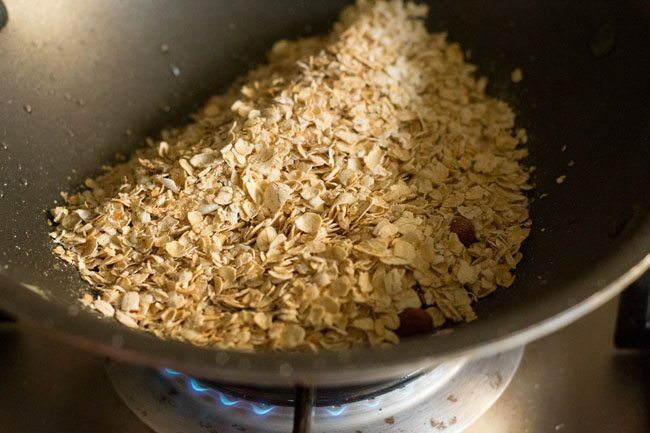 while making this oats chivda just roast the oats on a low flame or a low heat. else the oats may get too golden or brown. we don’t want oats to be much browned, just a tinge of brown is enough. 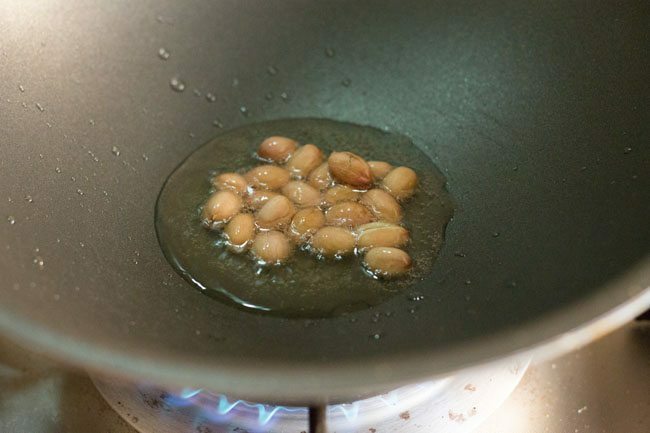 oil is only used for frying nuts and spices. measure all the ingredients and keep them separately in a plate or bowl. heat a kadai first. reduce the flame to a low and then add 1 cup quick cooking oats in a hot kadai or pan. roast the oats on a low flame. do keep stirring continuously while roasting oats. 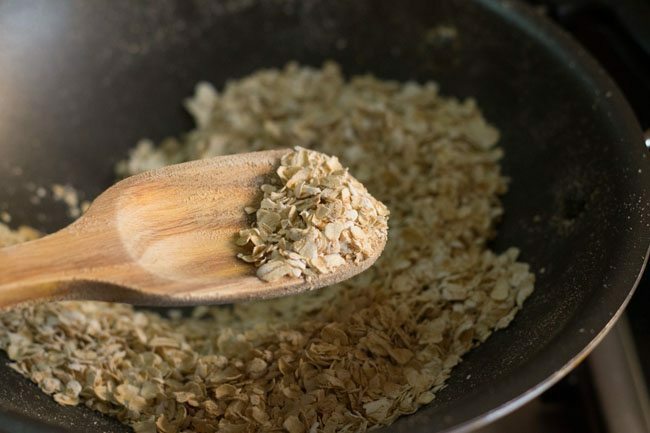 when the oats become light brown in color and are fragrant & crisp, then switch off the flame. just ensure they don't brown too much. transfer the oats in another plate. heat 1 tablespoon oil in the same pan. 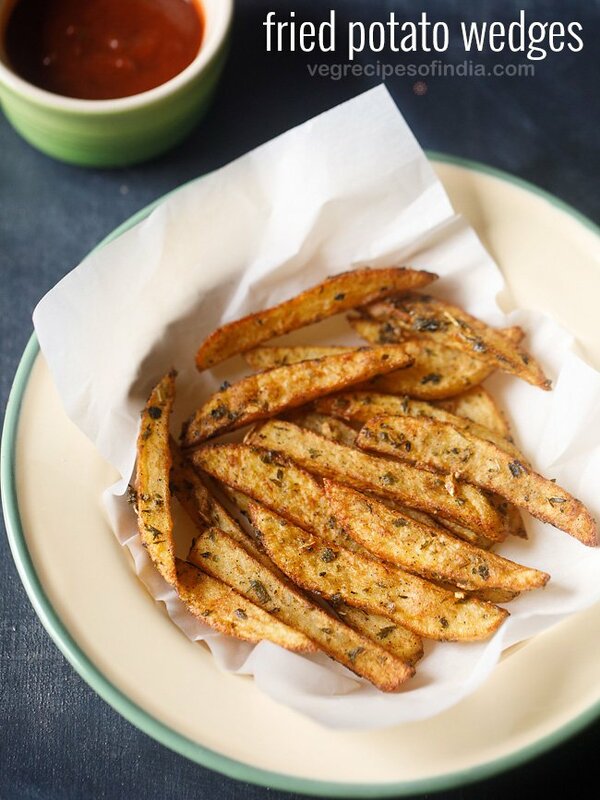 add 1 tablespoon of peanuts and fry them till they become crunchy and their color changes. place the peanuts on a plate lined with a kitchen paper towel. then add fry 5 to 6 almonds till they become crisp and light brown in color. 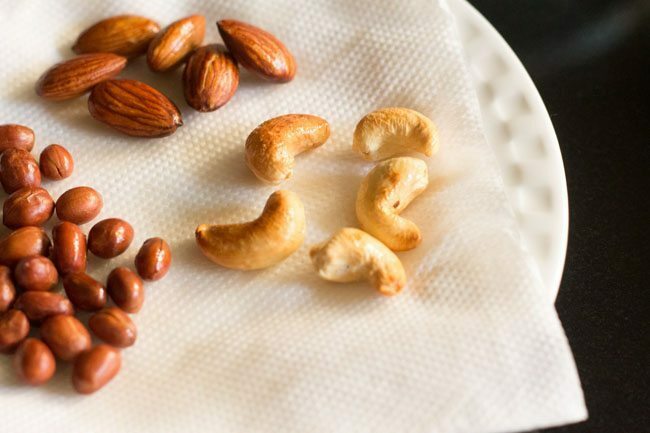 remove them and place the almonds on the same plate lined with paper towel. similarly fry 5 to 6 cashews till they become golden. remove them and keep aside. fry the raisins till they swell and become plump. keep aside. keep the flame to a low. then in the same pan, add 8 to 10 curry leaves, 1 to 2 chopped green chilies and a pinch of asafoetida. add ½ teaspoon of sugar. 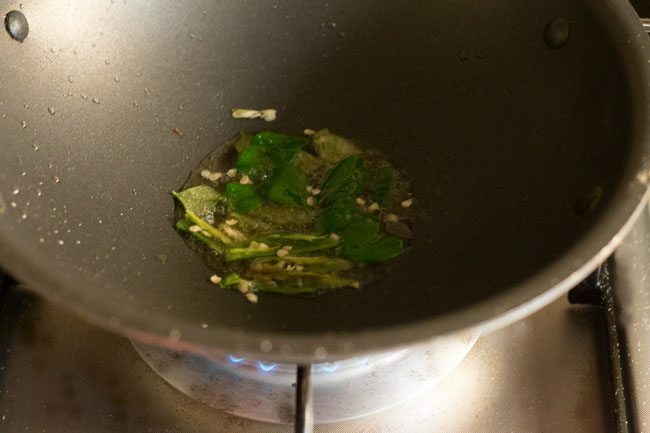 stir and saute for some seconds till the green chilies and curry leaves become crisp. 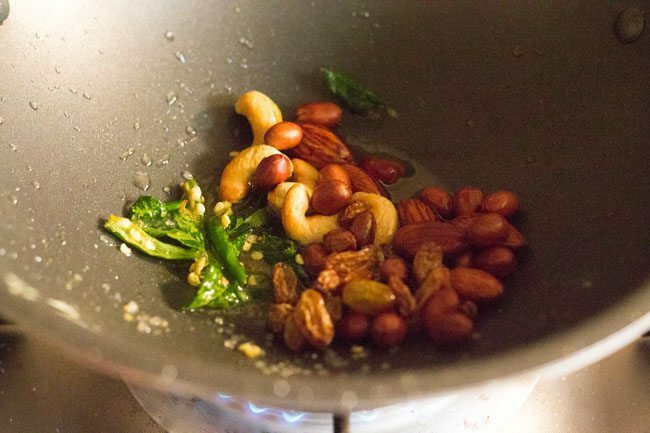 add the remaining fried ingredients - peanuts, raisins and cashews. mix very well. then add the roasted oats. mix the oats mixture very well. sprinkle salt as required. on a low flame, saute for 2 to 3 mins. then switch off the flame. remove and keep aside in a separate plate. 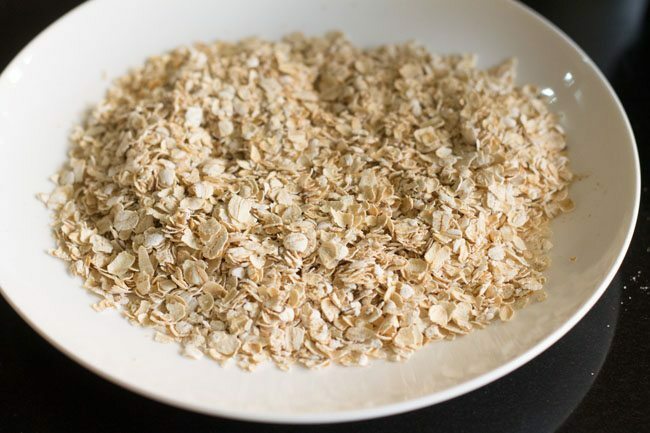 let the oats chivda mixture cool at room temperature and then store in an air-tight box and container. 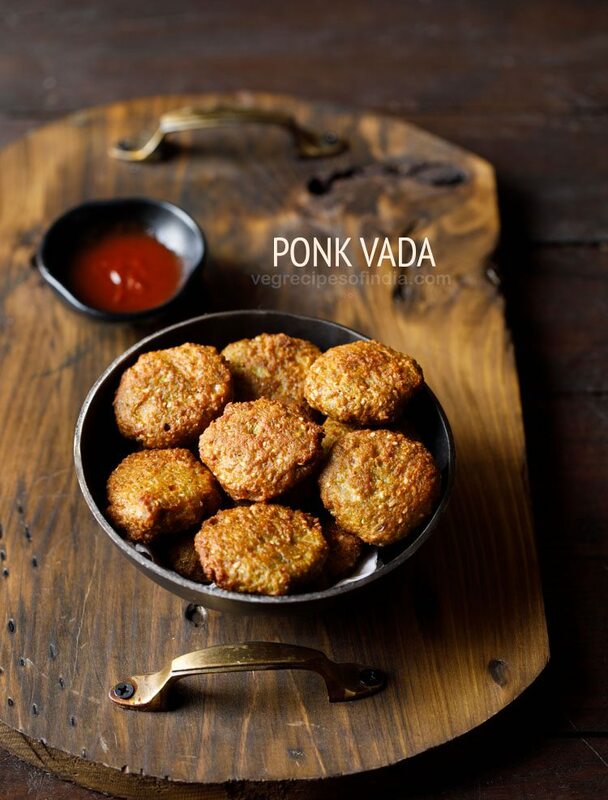 serve the oats chivda as tea time snack or as a diwali savory snack. - recipe can be doubled or tripled. - green chilies & sugar can be added less or more as per your requirements. - you can add more dry fruits if you want. 1. measure all the ingredients and keep them separately in a plate or bowl. 2. heat a kadai first. 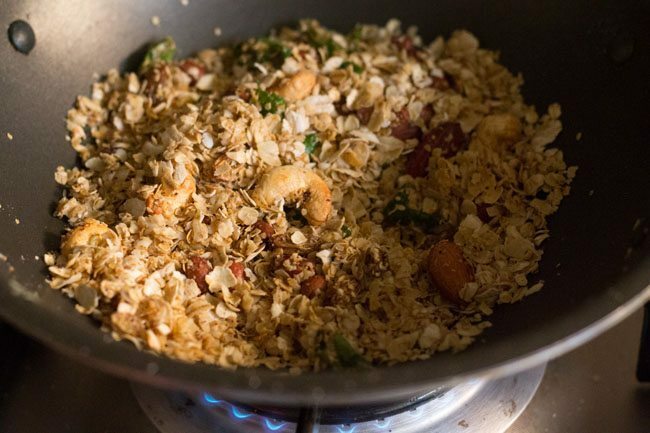 reduce the flame to a low and then add 1 cup quick cooking oats in a hot kadai or pan. 3. roast the oats on a low flame. do keep stirring continuously while roasting oats. 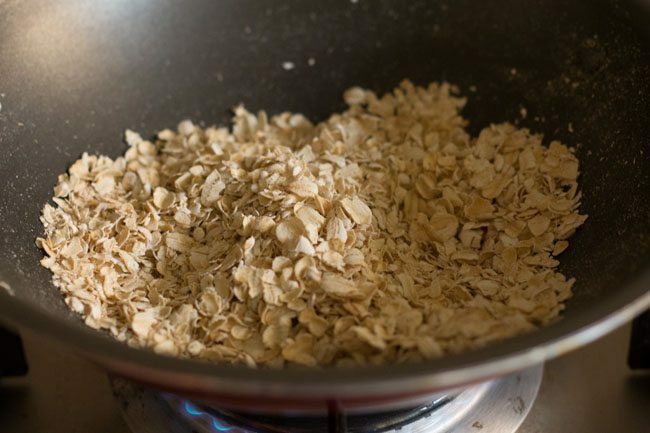 4. when the oats become light brown in color and are fragrant & crisp, then switch off the flame. just ensure they don’t brown too much. 5. transfer the oats in another plate. 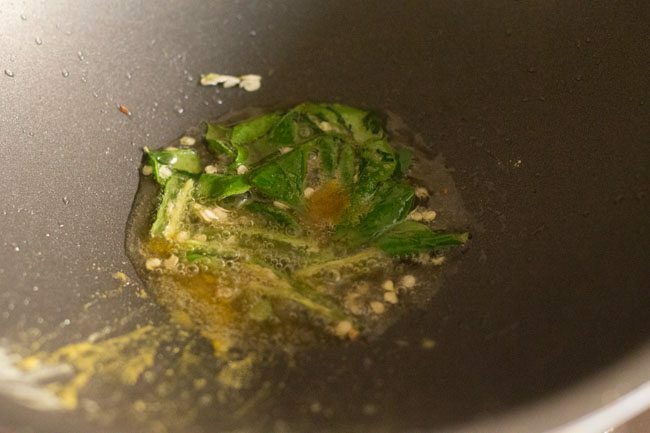 6. heat 1 tablespoon oil in the same pan. 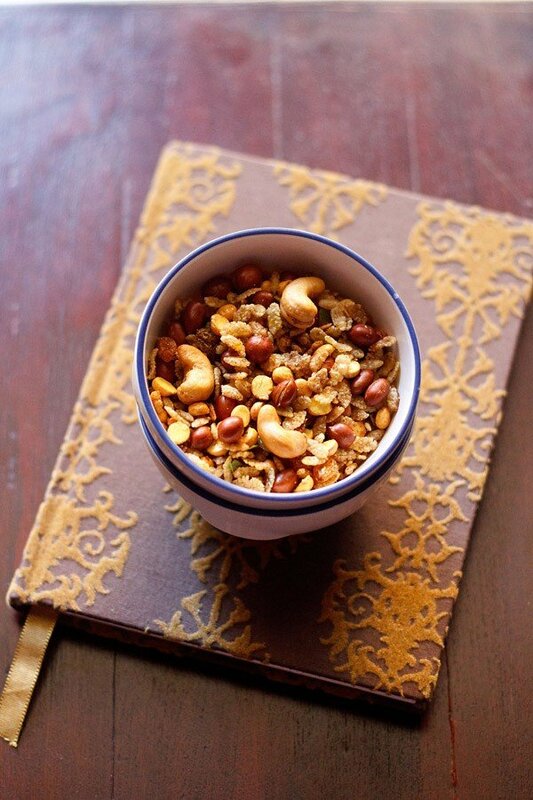 add 1 tablespoon of peanuts and fry them till they become crunchy and their color changes. 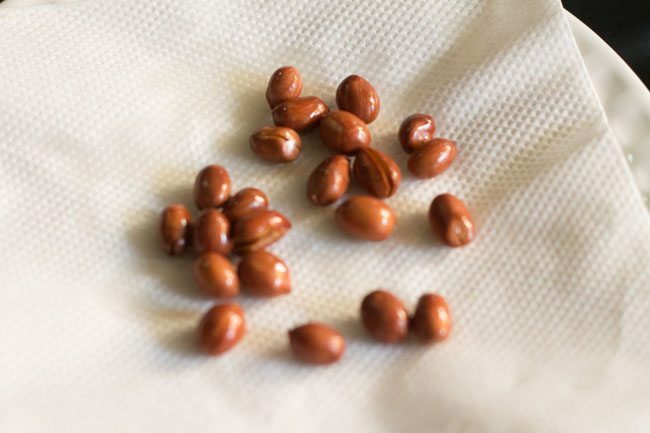 7. place the peanuts on a plate lined with a kitchen paper towel. 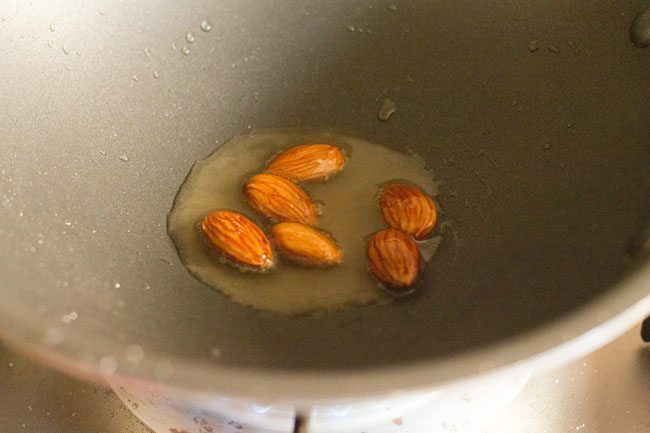 8. then add fry 5 to 6 almonds till they become crisp and light brown in color. 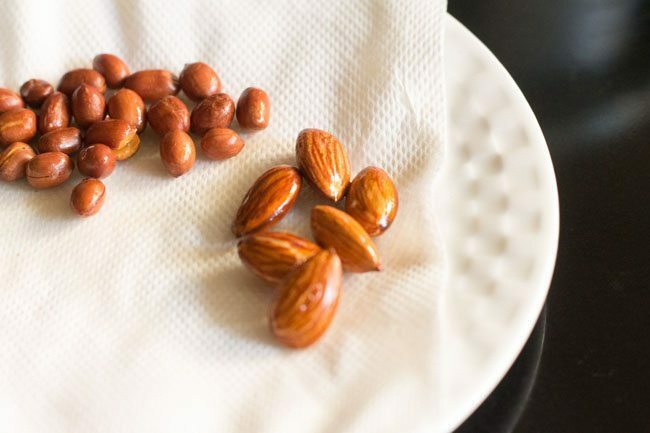 9. remove them and place the almonds on the same plate. 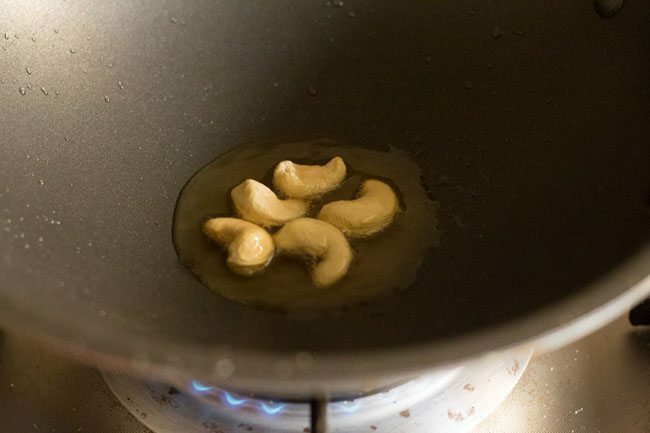 10. similarly fry 5 to 6 cashews till they become golden. 11. remove them and keep aside. 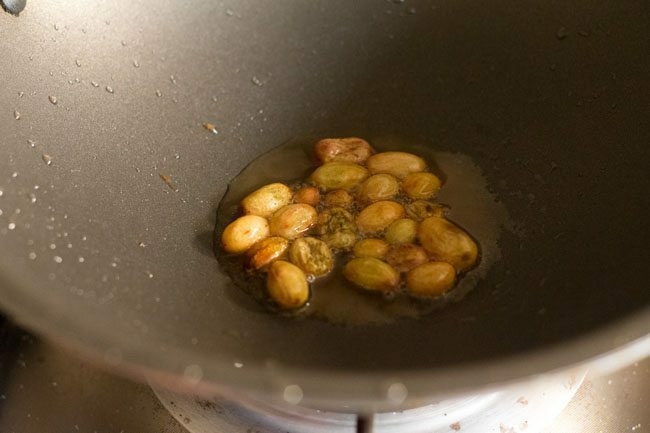 12. fry the raisins till they swell and become plump. keep aside. 13. keep the flame to a low. then in the same pan, add 8 to 10 curry leaves and 1 to 2 chopped green chilies. 14. add a generous pinch of asafoetida (hing). 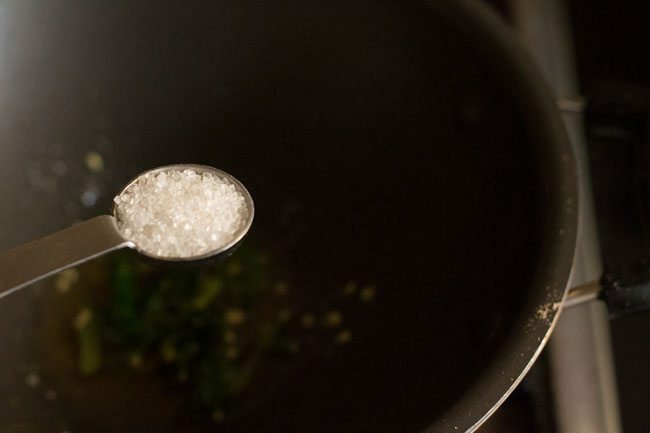 15. now add ½ teaspoon of sugar. stir and saute for some seconds till the green chilies and curry leaves become crisp. 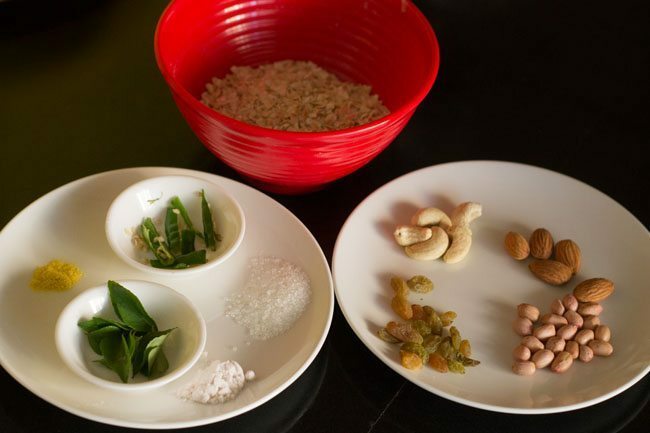 16. add the remaining fried ingredients – peanuts, raisins and cashews. mix very well. 17. then add the roasted oats. 18. mix the oats mixture very well. 19. sprinkle salt as required. 20. on a low flame, saute for 2 to 3 minutes. then switch off the flame. remove and keep aside in a separate plate. let the chivda mixture cool at room temperature and then store in an air-tight box and container. 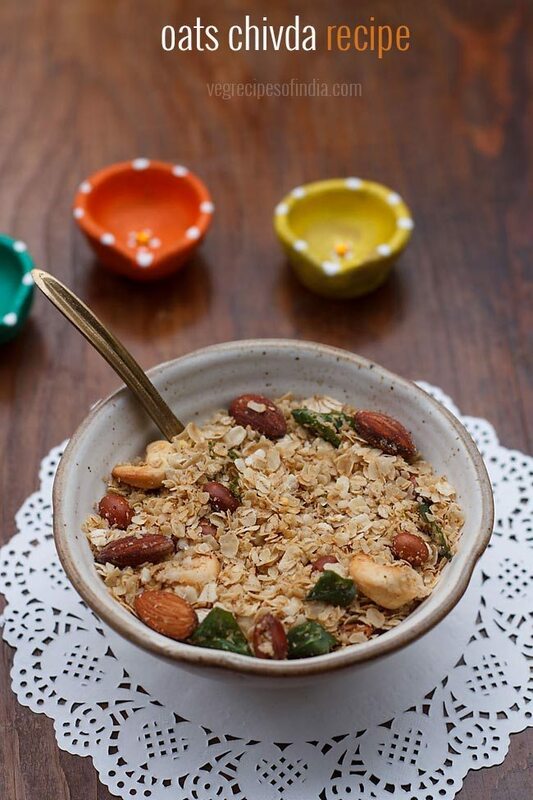 serve the oats chivda as tea time snack or as a diwali savory snack. I really liked this recipe. Thank you so much for such an innovative and healthy recipes of oats. thanks preet for sharing this feedback. very easy n tasty…tried it..!! thanks for the feedback abhishek. nice to know. it’s very easy and also tasty, all of you try this once.